If you've made the decision to buy a hot tub why not go for one of the best on the market. Thus 7-person spa from Lifesmart not only works well using an ozone type water system that uses minimal chlorine, it also looks good. This model is also energy efficient so it won't cause an astronomical electric bill every month. It even comes with a locking hardcover so you don't need to worry about children or pets getting in there without supervision. This is not a plug and play model so you will need an electrician to set this up for you. Equipped with 65 hydrotherapy jets and four-foot jets for the ultimate relaxation, this hot tub will become your new daily hobby. Reviewers can't speak highly enough about the quality and look. Some note that fitting seven adults would be hard, but it adequately will fit a family of five with a little room for comfort. Every person has their own personal preferences when it comes to a hot tub. Some like them bigger or smaller, complex with water jets or simple and straightforward. For this list, the best small hot tub caters to the type of individual who enjoys a spa-like experience with a series of water jets without paying the price of a full-size hot tub. 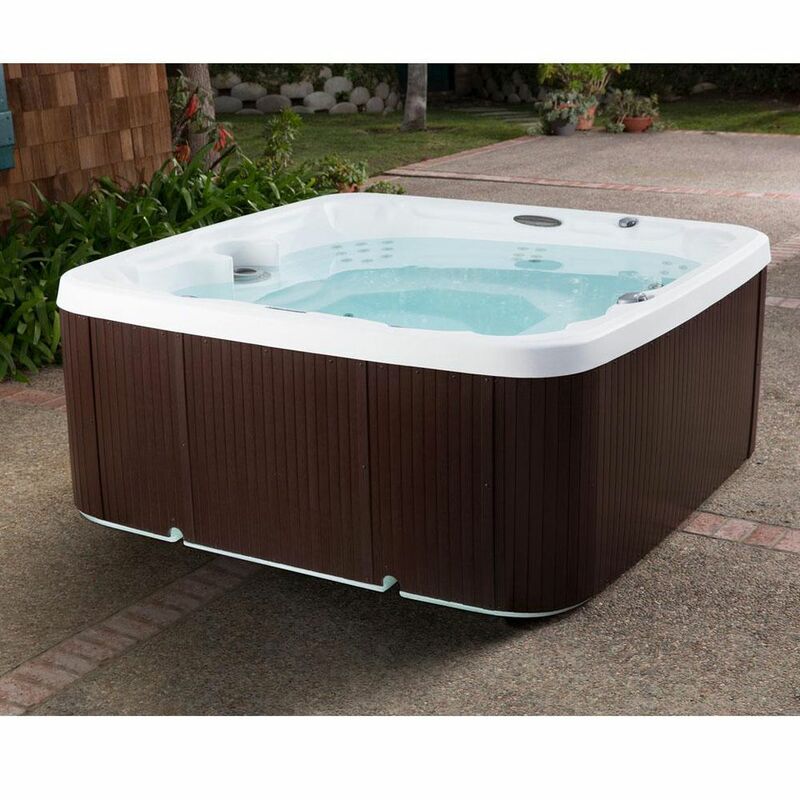 The Canadian Spa Company 2-Person Hot Tub is simply the best option to choose when you want a small hot tub for two without giving up any of the features and capabilities of larger options. This one provides an astounding eight jets per person for the best spa-like experience. With a profile larger than a normal tub, it is also easy to fit into smaller yards and patio areas when you don't want to sacrifice extra space. The QCA Spas Riviera Hot Tub manages to comfortably fit three people in a smaller-than-average profile. Providing 36 jets total, it also delivers the same type of spa-like experience that larger, more expensive hot tubs are known for. This one uses a "plug-and-play" solution using a 120 V outlet compatible power cord. The included heater and pump are both extremely energy-efficient for keeping the electricity bill down without sacrificing hot tub time. There is a fine line between normal and small sized hot tubs. In either direction, you will find hot tub options that either cater to a large number of individuals or two to three people. While this is good for many people, if you want just the right amount of hot tub space combined with upgraded features like whirlpool jets, the X is one of the best options to consider. In some ways, the Canadian Spa Company Plug & Play 4-Person Hot Tub is the ultimate hot tub around. Providing four dedicated spots, it gives up some premium person space for the extra features. With each spot coming with high-capacity water jets for a massage-like experience, this one is all about comfort and relaxation. The acrylic shell is extremely durable and easy to clean. More importantly, it offers a slightly smaller profile than the average sized hot tub. Coleman the name you've come to trust for camping equipment makes a solid inflatable hot tub that is perfect for households that want to be able to use a hot tub occasionally but don't want to install something the can be expensive and labor intensive. This model can seat four to six people and can be set up quickly without the need for added tools. It has a digital control panel that will warm the water up (about 2 degrees an hour) to 104 degrees for a nice relaxing soak. Your purchase also comes with a DVD that will help make set up a breeze and a filter to help clean out any bacteria that lurks in the warm water. Reviewers have commented this is an excellent tub for the price. One commented that if you can hook this up to an indoor faucet with warm water the heating up time will be a lot less than using cold garden hose water. Want to take a look at some other options? See our guide to the best inflatable hot tubs. Besides being an investment on your wallet, owning a hot tub can be an investment in time and maintenance. You'll need chemicals to keep the water clean, you'll need to fill and heat the water, clean the actual tub and much more to keep it running efficiently. If you are looking for something a little easier to maintain this Plug and Play Spa from Aquarest doesn't require an electrician to set it up, you just need to plug it into a 120-volt outlet for it to function. The water filtration on this unit is easy to maintain and it will keep your water clean and fresh while in use. Reviewers note this is a wonderful tub for the price that requires minimal maintenance but it can take up to a day to fully heat up the tub. If you want the ulimate relaxation experience look no further than Niagra 7-Person hot tub from Candian Spa. With this purcahse no only will you get a tub with 60 jets, it also comes with pop LED speakers to kick back with your favorite tunes, a waterfall for relaxing sounds and an aromotherapy option that lets you add custom sense to your spa experience. All of this comes at a hefty price tag and you'll also have to pay to get this installed which adds to the cost, but reviewers love this product, for the efficent jets, quick heating and amazing sound quality speakers that are an added bonus. Many customers have also commented that company is easy to deal with which makes this a wonderful purchase for those who have the budget.